Ive seen systems with 21 planets with life. I bet they weren't at the very center of a star cluster though. Nothing special in the new version, really. Ive seen systems with 21 planets with life. Like HarbingerDawn said, they are at the center of a star cluster. I found a 20 planets with life system, but didn't post for the exact reason you stated. It would be very hard (understatement!) for life to exist in that sort of environment. I'm surprised that a system like that could exist that close to the core a cluster. I found several planets with pretty small mass and very dense atmospheres (100 atm). Close example is Barnard's Star 2. Is this feature or bug? Shouldn't they lose the atmosphere due to small gravity? Thanks. Btw. I have discovered system RS 8409-1353-9-94747390-6 where are 4 floater multicellular life planets! My hypothesis is that they simply had to discover spaceflight and colonize the other planets, because it seems highly unlikely that this would occur randomly. If it is as I think, thank you for this great surprise! 4 floater multicellular life planets! Not sure if your referring to something else but I believe systems in Space Engine 0.971 can now have 20+ planets/moons with life, and I too doubt it did not happen randomly, they definitely would have had to invent space flight to colonize the other planets, or an event that caused them to be carried/flung through space to the others or 1 single event gave all four life during the same time period, or they are just resistant to vacuum and just flew (Somehow through evolution?) to the other planets and came to a stop in the atmospheres since they are floaters after all, not terrestrial life forms. But since Floaters are life forms in the atmospheres of planets (Floaters only occur on gaseous planets (In SE anyway), correct me if I am wrong) and not on the ground, they would have had to invent technological space flight while floating if the latter did not occur, so how did they get the materials let alone solid materials, and keep them afloat etc..? It's just interesting to think about, there are heaps of possibilities. Hello there! I would like to show all of you some kind anomaly I've just discovered. It is a planet, orbiting a blue main sequence star and a red, bright giant. It's very, VERY far away ((Almost 600 AU from the barycenter)) but it's still incredibly hot. ((Over 600 degrees Kelvin)) But that's not the anomaly I've noticed. The planet has ENORMOUS moons. Or at least they seem so from the surface. 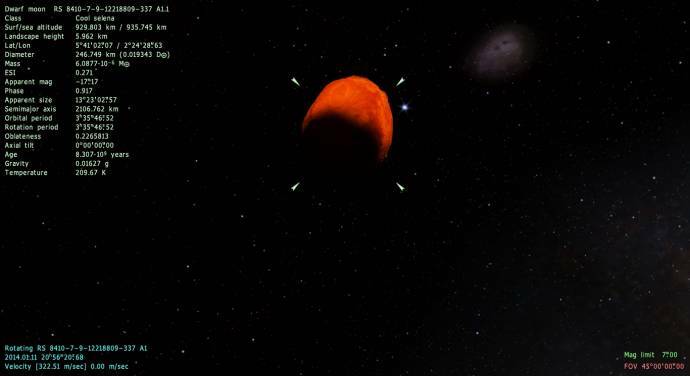 The moons aren't really that big, but they are VERY close to the planet. I'm pretty sure they should cause some kind of deviation with the orbit, moving the barycenter or anything. Or just crush into each other because of how close they are. Lately with the latest update I've found alot of egg shaped stars. I've noticed this with dwarf planets too. Sometimes they have comparitively large moons really close to the surface. 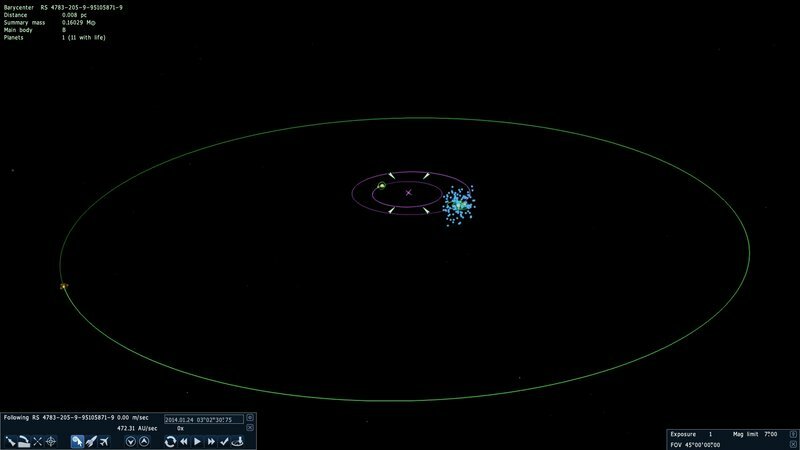 They would actually be less likely to have a barycentre with the dwarf planet at a significant distance from its core because of their proximity, though. Whoa! They are really close, I have never seen anything like that before . Another 200 kilometers closer and it will be touching the planet! Not sure if the closest one has breached the roche limit or not, but the parent planet has a small amount of gravity (But ten times that of the moon) and has a low density of around very roughly 1 gram per cubic centimeter, and that moon has a density of very roughly 4 grams per cubic centimeter. Also considering most of the other variables as very rough estimates it's probably likely that it hasn't but is close (Forgive me if my rusty calculations are off, I haven't done this in a while (couple years now), I would like someone with more knowledge on the subject (Roche limit) to correct me or improve on my result). where rR is the Roche limit, ρ represents density, M is for primary body, m is secondary, and R is the radius of the primary. General rule of thumb: If the densities are comparable, then the Roche limit lies at about 2.4 radii from the primary body. (The densities are comparable in this case; check your math -- they should both be in the 6 g/cm3 range. And none of the moons are below 4 g/cm3. You can also check density in the wiki (press I, and click physical characteristics tab). For the inner moon, I calculate the Roche Limit to be at 2.5 radii. The moon is at 1.5 radii, so well inside. It would probably be broken apart in reality. However, it is possible for objects to lie within the Roche limit and not be disrupted if their material strengths are very high. E.g. Mars' moon Phobos lies slightly inside of this limit. Wow, that's amazing. Thank you for the correction. Although I used the old mass divided by volume to get my density, I was still shamefully off target, probably because I ignored figures after the decimals. That is indeed an anomaly in my mind, almost halfway through the Roche limit. Does SE take the Roche limit into account when generating systems? This system here is quite multi-layered, with 3 stars inside, two of which are really close together circling their own barycenter, and have each a (dwarf)planet on their own, while this sub-barycenter has a few planets (which is the normal part). On the other side of the main barycenter, there's a few planet that got moons with elongated & tilted orbit, and also fast orbiting moons (like 2-hr period) and gas giant (2-day period). The main barycenter also has a very very far away planet. And a total of 11 planets/moons that have life (both unicellular and exotic multicellular), even on the outermost planet's moon. Do you have real planet brightness turned off? If both stars are incredibly far away and give barely any light (as seems to be the case given this brown dwarf is dimmer than Saturn in opposition), turning real planet brightness off will simply mean both their light will get boosted to a similar level as Earth daylight. 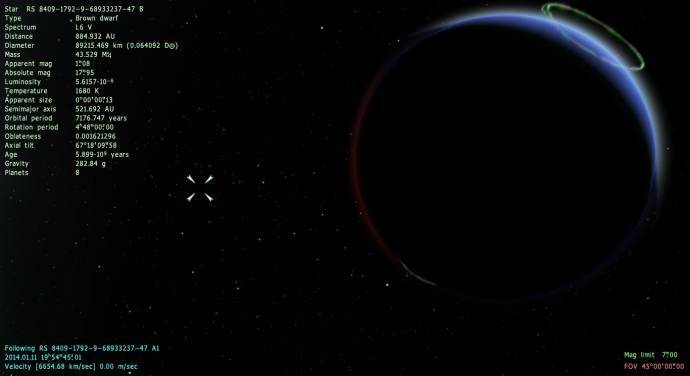 With real planet brightness on, the planet would likely be dark as a cave. Even the game thinks im on its surface..